Planning a graduation party for a graduate or a going away bash for the soon-to-be college student? You picked out the food, decided on the decorations and planned and sent the invitations. The last important piece you don’t want to forget is the cake. Use the beautiful cake as a centerpiece on your food spread table or as a decoration on the gift table. After all, it’s the last thing to be cut so your guests can admire it throughout the entire party. We offer beautiful graduation-themed cakes for all guest list sizes up to 80 people. Customize the cake by selecting your cake flavor, icing flavor, icing color and border design. Don’t forget to place your order with your local Bakery at least 24 hours before you need to pick up the cake. Choose your school’s colors and personalize your cake to show your school pride. 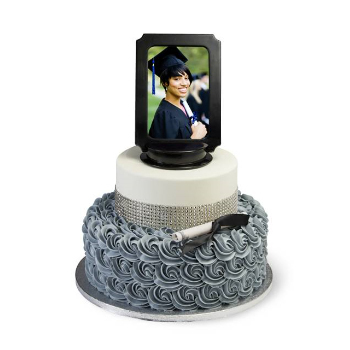 If you want to add even more personalization, consider adding one of our photo frame cake toppers and display your graduation picture. Choose your favorite 4×6 photo and show off that proud smile for your family to see. For more information about these delicious desserts, check out our blog that dives into detail about each selection. If you want to offer your guests other dessert treats, choose from cookies, brownies and even scones. If you’re still deciding on other food options, check out our graduation party planning blog. You can even place your order using our Online Easy Ordering platform. All the hard work is done, so now it’s time to celebrate with your graduate! Share your favorite cakes with us in the comments below. Caroline A. started with Publix as a cashier in 2015 and has developed a passion for writing and social media. She loves being a part of Publix’s culture and enjoys bringing new ideas to The Publix Checkout by writing about topics customers might not know about the company. Pub Subs and Publix Sweet Tea are her favorites, and you’ll always find her with an iced coffee in hand. Outside of work, Caroline enjoys traveling, watching college football and playing with her fur child.